If you have any questions about the ADMIRAL 35 information page below please contact us. This motor yacht ADMIRAL 35 is a 35 metre 115 (ft) good sized aluminium luxury yacht which was made by Cnl (Cantieri Navali Lavagna Amy / Admiral Mariotti Yachts) and her design is by Cantieri Navali Lavagna (Cnl). The graceful superyacht was designed from the naval architecture of Cantieri Navali Lavagna (Cnl). Luca Dini Design acted on the interior design and styling. CNL Admiral 35, as her name Be Cool suggests, really is a semi displacement planing motoryacht with two decks plus half-deck and flying bridge which was built completely from aluminium alloy 5083. Yacht Be Cool's external designs ar by Luca Dini Design studio and the CNL yard's Centro Stile and her hull was designed by Studio Bacigalupo. The interiors are by the Rome studio Magazzini Associati. Cantieri Navali Lavagna (Cnl) was the naval architect involved in the professional nautical plans for ADMIRAL 35. Her interior design was conceived by Luca Dini Design. Cantieri Navali Lavagna (Cnl) is also associated with the yacht wider design collaboration for this boat. 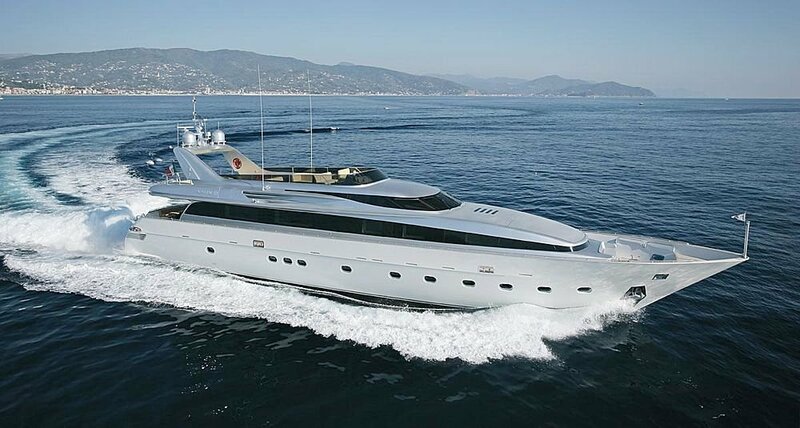 In 2006 she was actually launched with accolade in Lavagna and following sea trials and detailing was then delivered to the owner. Cnl (Cantieri Navali Lavagna Amy / Admiral Mariotti Yachts) completed their new build motor yacht in Italy. The hull was crafted from aluminium. The motor yacht superstructure component is made predominantly with aluminium. Installed with twin MTU diesel main engines, ADMIRAL 35 can reach a high speed of 28 knots. She is driven by twin screw propellers. Her total HP is 5550 HP and her total Kilowatts are 4140. 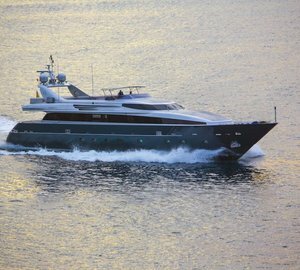 The good sized luxury yacht M/Y ADMIRAL 35 can sleep a total of 8 passengers and 5 crew. 35 metres / 115 feet. Approximate Cruise Speed is 30 knots. The luxury yacht ADMIRAL 35 displayed on this page is merely informational and she is not necessarily available for yacht charter or for sale, nor is she represented or marketed in anyway by CharterWorld. This web page and the superyacht information contained herein is not contractual. All yacht specifications and informations are displayed in good faith but CharterWorld does not warrant or assume any legal liability or responsibility for the current accuracy, completeness, validity, or usefulness of any superyacht information and/or images displayed. All boat information is subject to change without prior notice and may not be current.